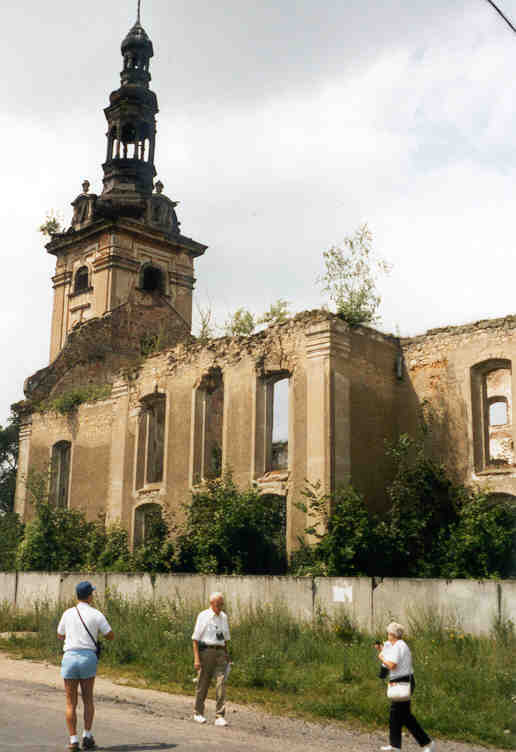 During World War II, Harpersdorfers fled to Isergebirge in February, returning in May to find their homes and the Harpersdorf Refuge Lutheran Church plundered and in ruins. It has never been restored and is in a very deteriorated state. Across the road is the lane that leads to the Viehweg Monument. 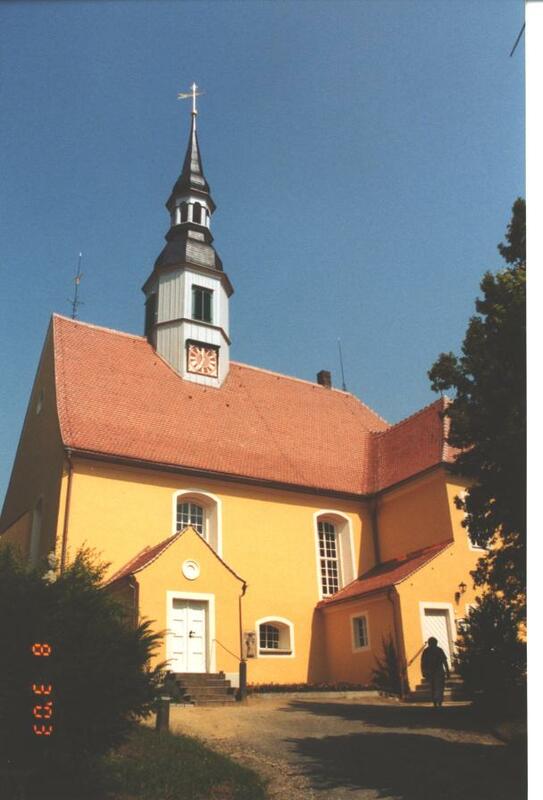 Three booklets about the former village of Harpersdorf, Germany, are worth reading – The Refuge Church in Harpersdorf, by Siegfried Knörrlich, translated by Sherman L. Gerhard, The Society of the Descendants of the Schwenkfeldian Exiles, 1980; A Challenge: Am I My Brother’s Keeper? Sequel to The Schwenckfelder Migration, 1734, Schwenckfeldiana, Vol. II, No. 2, Board of Publications of The Schwenkfelder Church, September 1951; and Exiles of Harpersdorf The Ties That Bind: Excerpts from Und Weider lebt die Heimat: Wege der Erinnerung-Wege der Versöhnung, by Bernhard Hauptmann, translated and edited by Allen Viehmeyer, Schwenkfelder Library & Heritage Center, 2010. Viehweg monument on the day of rededication, August 2, 2003. The Schwenkfelders were considered heretics and denied burial in a church cemetery because of their religious beliefs. The bodies were taken to the cemetery by night with no more than a prayer — no tolling of the church bell, no music, no procession. 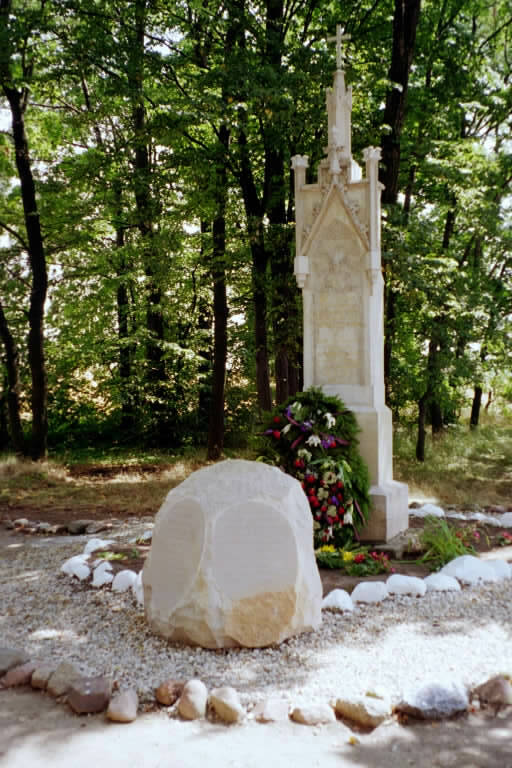 The Viehweg Monument in Harpersdorf, erected in 1863, remembers those Schwenkfelder ancestors who were buried in the cattle paths (a sign of disgrace) of Probsthain, Harpersdorf, Armenruh, Langneundorf, and Lauterseiffen. The Viehweg Monument in Twardocice (Harpersdorf) celebrated its 150th Anniversary in 2013. 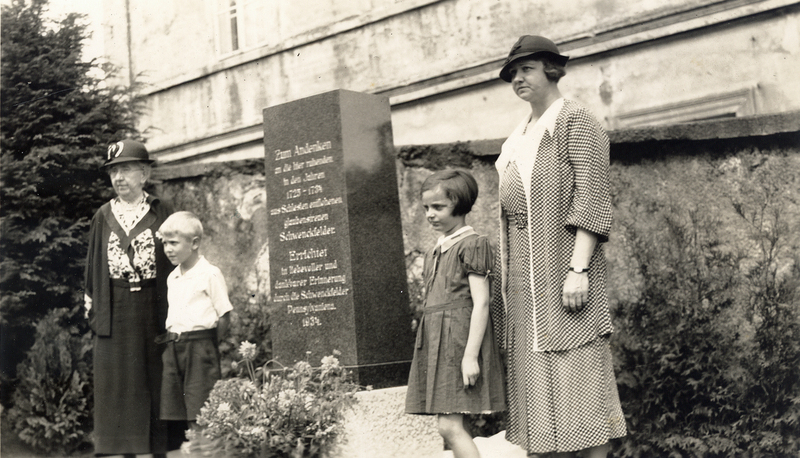 This memorial to our Schwenkfelder ancestors, nearly destroyed during World War II, was fully restored in 2002 and re-dedicated in 2003. At that time, a translation stone was added, providing English and Polish language versions of the German language text. Postcard: Groditzberg/Grodiec Castle where many Schwenkfelders were imprisoned for not attending the State Church or sending their children to attend. 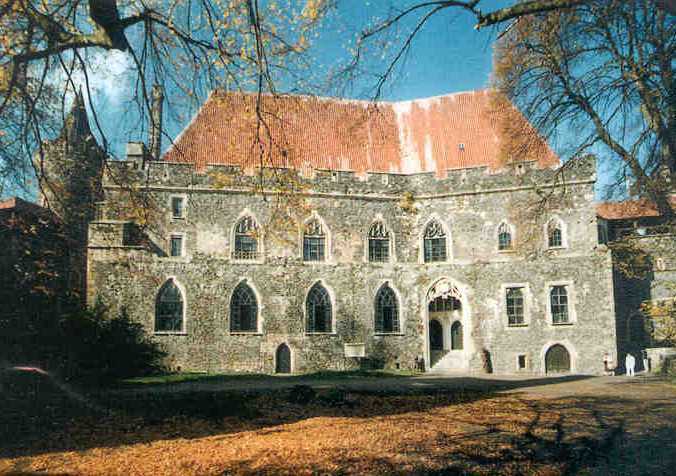 The Groditzberg Castle is where many Schwenkfelders were imprisoned. This fortress on a mountain top has been restored and is in remarkably good condition. The remains of a moat around the castle are evident as one enters through a narrow gate. The inner courtyard, now available for picnics, gives graphic impressions of living conditions in the 18th century and before. Portions of this edifice may be toured to gain a sense of living conditions in the 1600s and 1700s. After leaving Silesia, the Schwenkfelders made their way to Herrnhut and Berthelsdorf. Herrnhut is the Moravian center where Count Zinzendorf provided protection to the Schwenkfelder refugees and permitted their settlement on land in and around Herrnhut and Berthelsdorf. They lived in this area for 6 to 8 years after leaving Harpersdorf in Silesia and before migrating to Pennsylvania. “While residing in Berthelsdorf, the Harpersdorf refugees received permission to build dwellings. 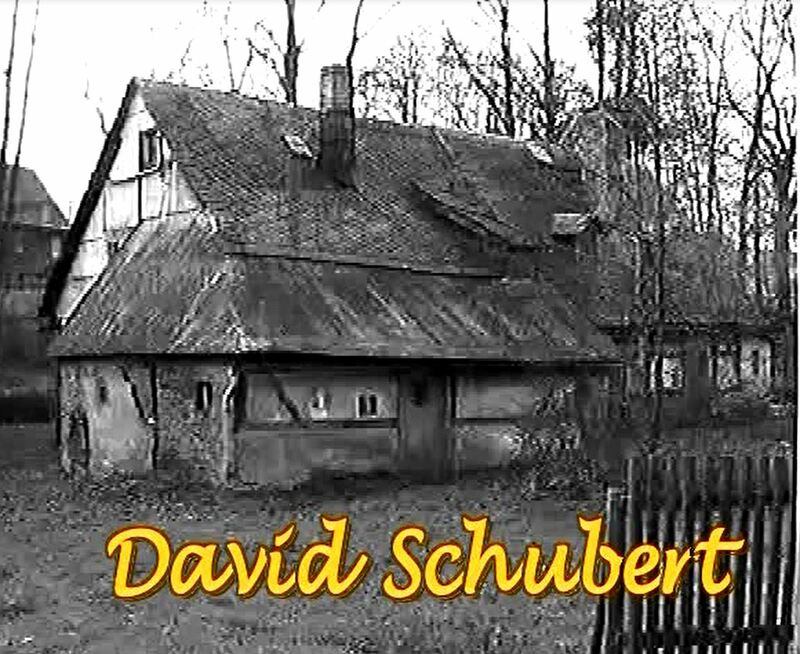 Unfortunately we do not know today how many homes were constructed by Schwenkfelders. In July 1905 Schwenkfelder Elmer E. S. Johnson, a member of the Corpus team situated in Wolfenbüttel, Germany, made his first visit to Berthelsdorf. 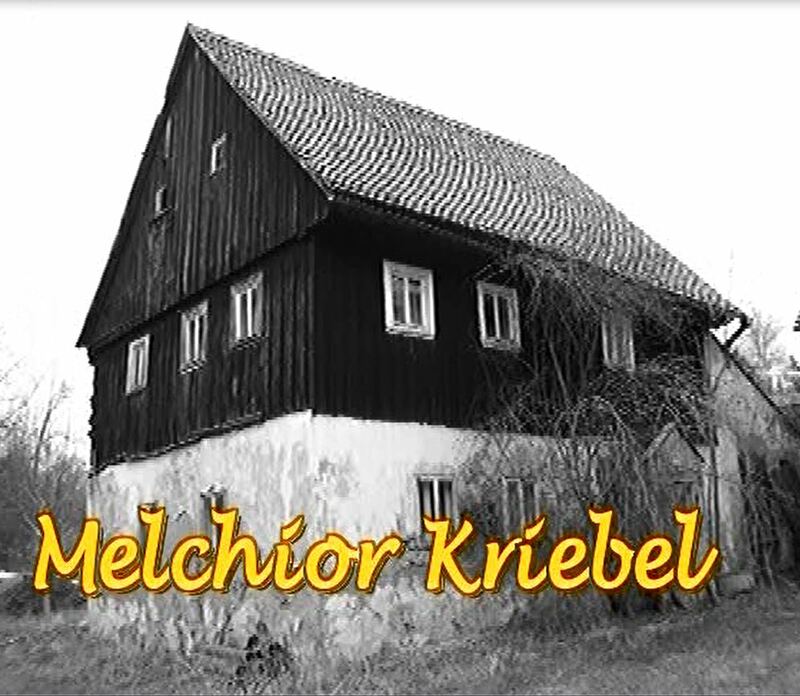 Among many reasons for traveling to Berthelsdorf, Johnson was searching for the Melchior Schultz ancestral home. 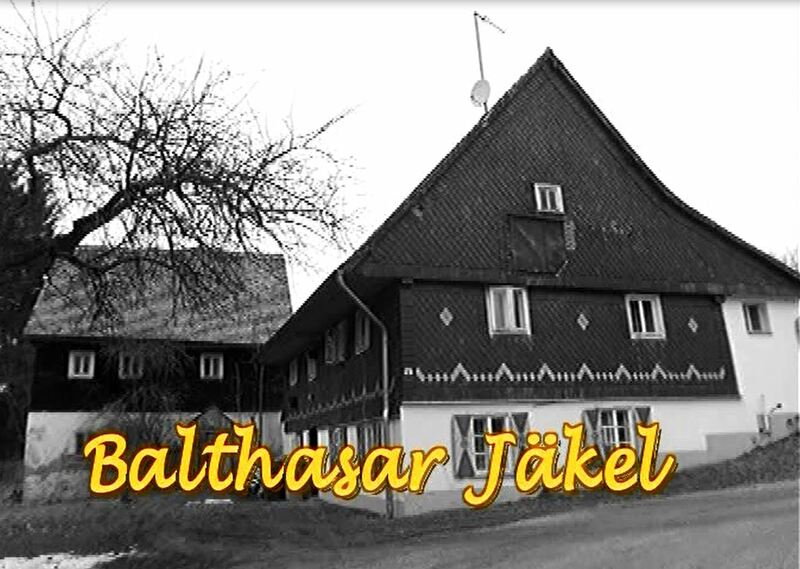 Johnson’s stay in the village lasted from July 20 to July 24 during which time he learned as much as possible from local people, present home owners, and real estate sales records about several original Schwenkfelder homes, all located in Upper Berthelsdorf. All of this information was recorded by Johnson in his diary. He was able to determine ten homes built and owned by Schwenkfelders (each property-house had a number). These properties were*: Caspar Kriebel (#62), Georg Reinwald (#63), Hans Wiegner (#64), David Schubert (#65), Builder Unknown (#69), Balthasar Jäckel (#95), Melchior Schultz (#98), Melchior Wiegner (#100), Melchior Meschter (#101), and Melchior Wiegner (#103). “Of these ten properties, property #69 was the only one for which Johnson could not find a recorded original owner. Today this property is known as the Gemeindehaus. 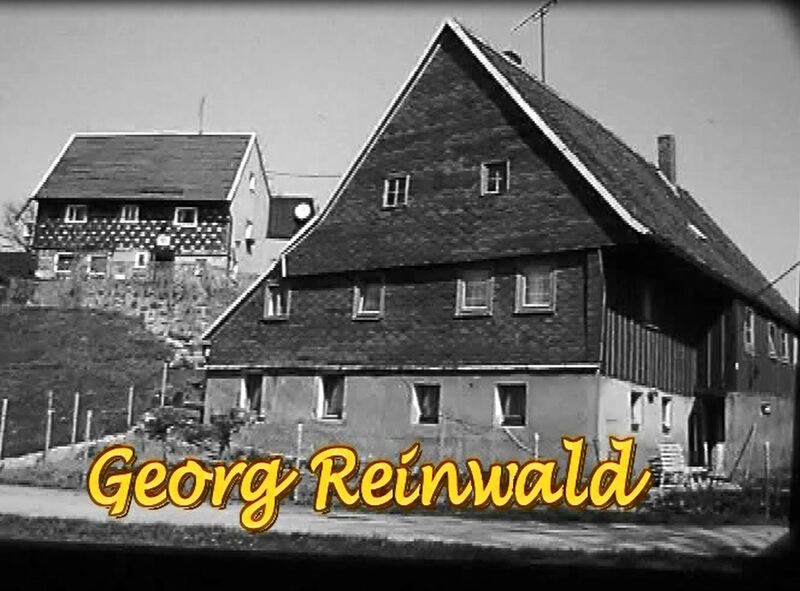 The German word “Gemeindehaus” consists of two words: “Gemeinde” and “Haus.” The word “Gemeinde” signifies “the local community, especially its governing body”; “Haus” denotes a building of any size, not just a small dwelling. 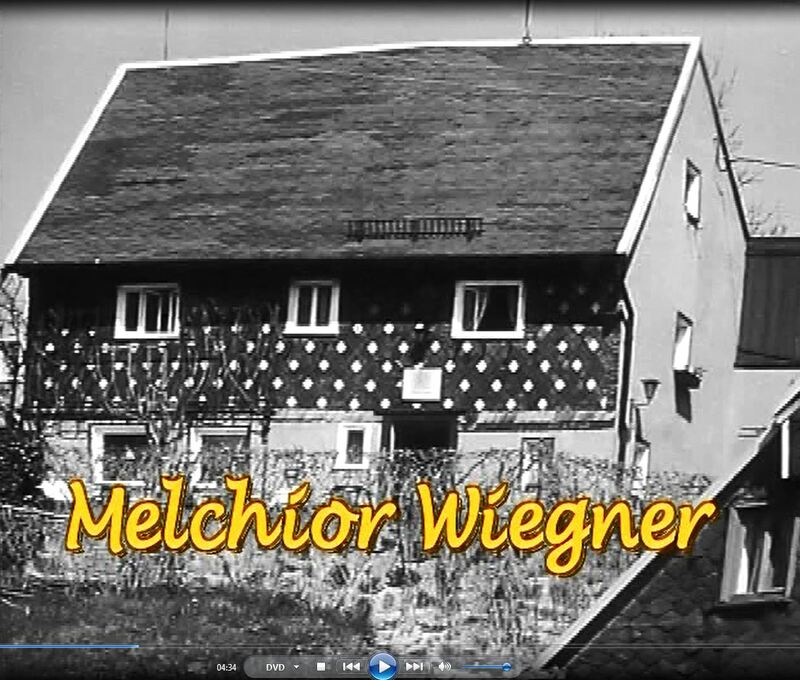 The term “Gemeindehaus” has become an important part of Schwenkfelder Heritage vocabulary. 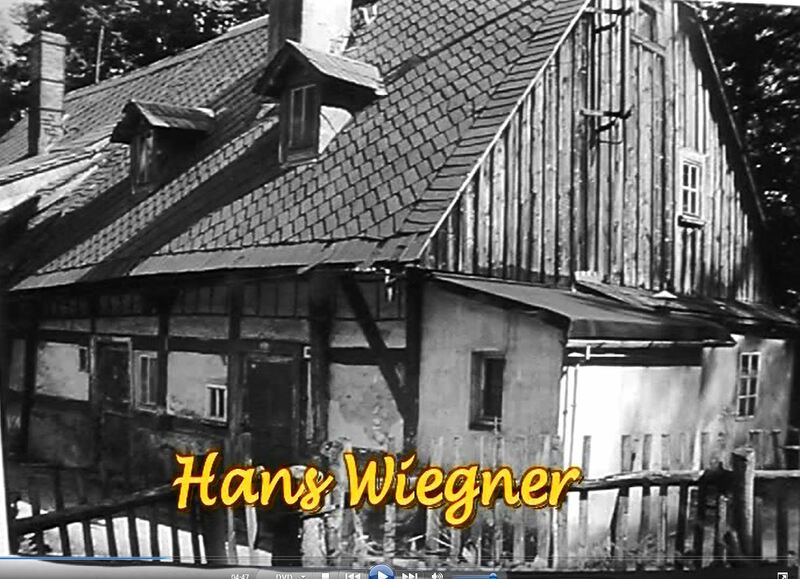 It is frequently found in presentations about Schwenkfelder history, especially in descriptions of Berthelsdorf, Saxony, the refuge of Schwenkfelders escaping the Jesuit mission in Harpersdorf, Silesia, between 1726 and 1734. “In 1905 this house was occupied by August Müller and family, and had been in the Müller family for several generations. Müller had two copies of the original deed and told Johnson the earliest history of this house, recounting the tradition that when the Schwenkfelders departed in 1734, they were unable to sell the property, and so gave it to the Gemeinde – the governing body of the village. The property seems to have remained in government hands until it was sold on September 15, 1792, when Frey Frau von Watteville sold it to August Müller’s ancestors, the brothers Johann Gottfried and Johann Gottlieb Müller. By 1905 the house had been divided into two parts, but when that happened is uncertain. The Gemeindehaus was in dire need of repairs. 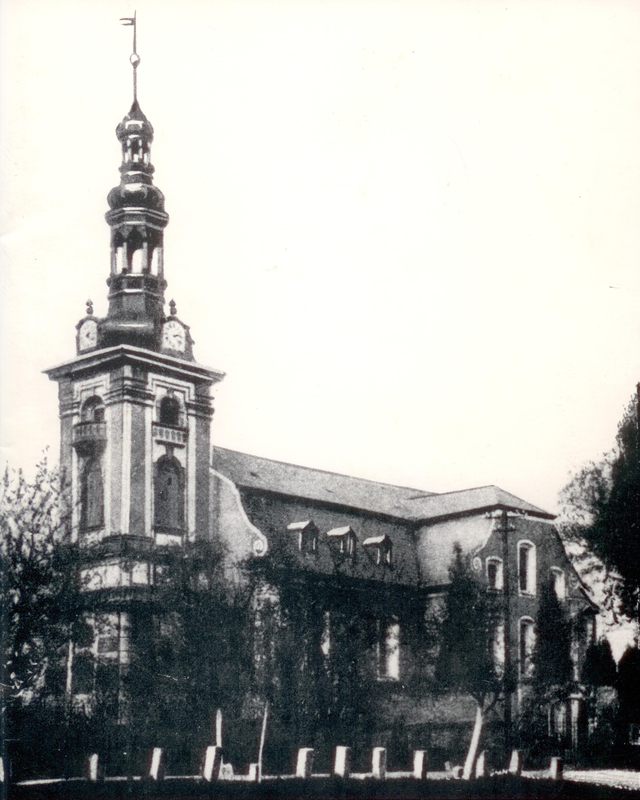 Some years ago, the Gemeindehaus Association was formed to preserve the Gemeindehaus, restore it, and open a museum interpreting the Schwenkfelders and the Protestant church in Silesia. Overcoming many hurdles, the association has received generous grants from the European Union as well as many matching funds from local interested people, the town of Berthelsdorf, and the Schwenkfelders in America. The mission of restoration is slowly being fulfilled with progress visible to the visitor today. It is projected to be completed and opened sometime in 2017. The Berthelsdorf Lutheran Church (now Evangelical Church of Berthelsdorf) was the place of many Schwenkfelder baptisms, marriages, and funerals as indicated by their records. 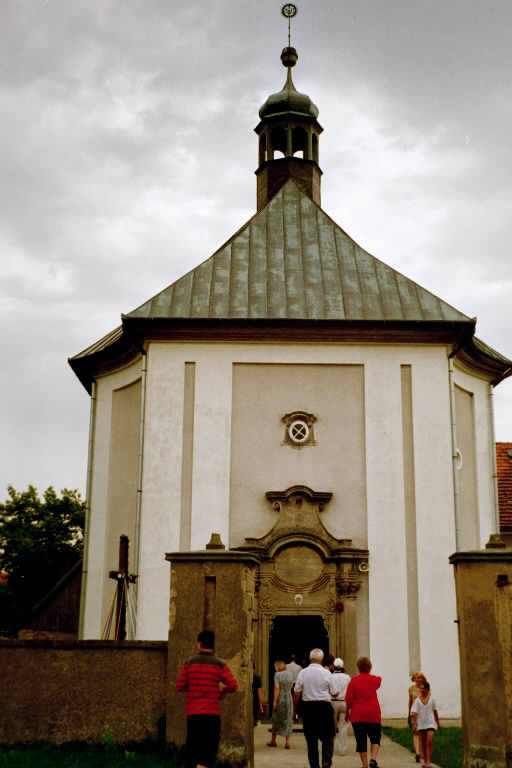 Behind the Evangelical Church in Berthelsdorf is a monument, unveiled in 1934, honoring those Schwenkfelders buried there between 1725 and 1734. This town was left virtually untouched by the bombing that took place in nearby Dresden during World War II. 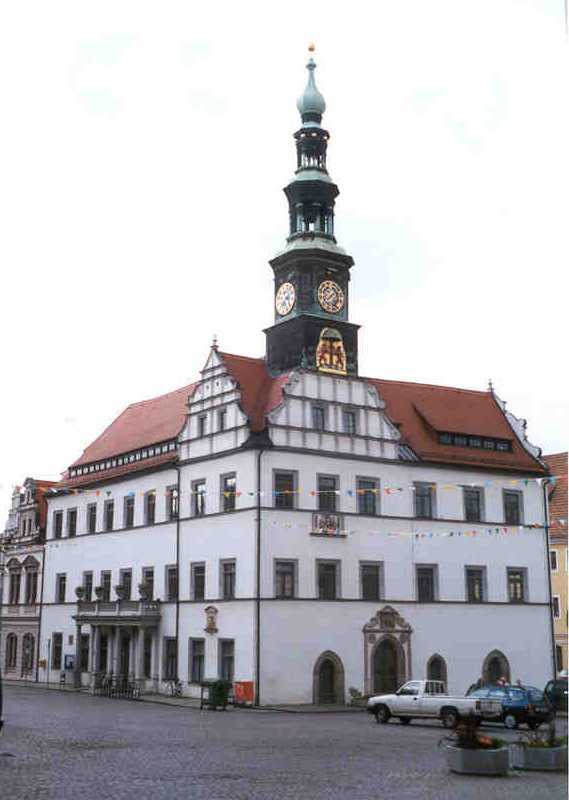 The narrow streets, quaint shops and the Rathaus, or city hall, are all reminiscent of the days when Schwenkfelders prepared to leave Saxony for Pennsylvania. It is easy to visualize the anxieties they faced as they set sail down the Elbe River from this town to Altona, near Hamburg.